We’ve had another productive week here at Stu Brew. On Monday Evening Emily and Jack presented at the Pint of Science event at The Old George Inn! It was a very successful evening and was a great opportunity to explain the brewing processes to a very interested audience. We’d like to extend a big thank you to everyone who came and watched. This week last year’s treasurer Harry has been busy making our cider, Copy & Paste, ready to serve another batch at our next Brewery Bash in June. Also on the brewing calendar this week we’ve seen Chris and Arthur brewing True Wisdom which will be available in keg soon! Home Brew Club have also kept busy this week by continuing their work on a prototype of non-alcoholic Lab Session. 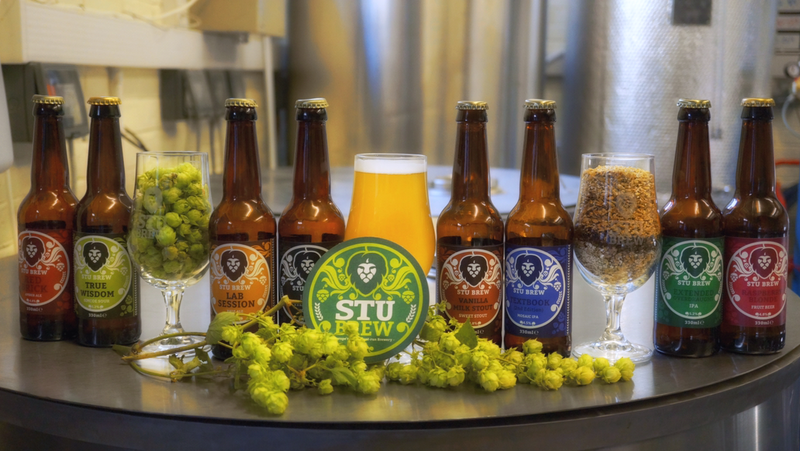 We received an exciting delivery this week which was the first sample of our NEW Stu Brew growlers. Although we’re in the process of altering the design here’s a sneak peak of the first sample. Our growlers have been designed in time for the upcoming graduation ceremonies here at Newcastle University and will be available for purchase at Graduation filled with Graduation Saison 2018 tied in a ribbon reflective of your faculty colours. They’ll also be on sale at our upcoming Brewery Bash.. but more about that later! We have a busy month of events organised at Stu Brew which means plenty of opportunity to try our selection of beers! Keep an eye out on Twitter and Facebook this coming week.. something BIG is about to happen!